Ansel Adams – photographer, musician, naturalist, explorer, critic and teacher – was a giant in the field of landscape photography. His work can be viewed as the end of an arc of American art concerned with capturing the “sublime” in the unspoilt Western landscape. This tradition includes the painters Albert Bierstadt, Thomas Cole and Thomas Moran, and the photographers Carleton Watkins, Timothy O'Sullivan and William Henry Jackson. For much of his early adulthood, Adams was torn between a career as a concert pianist versus one in photography; later, he famously likened the photographic negative to a musical score, and the print to the performance. Yet most museumgoers are only familiar with the heroic, high- gloss, high-contrast prints that Adams manufactured to order in the 1970s-80s, coinciding with the emergence of the first retail galleries devoted to photography; as performances, these later prints were akin to “brass bands.” Much less familiar are the intimate prints, rich in the middle tones – the “chamber music” – that Adams crafted earlier in his career. The present show focuses on the masterful small-scale prints made by Adams from the 1920s into the 1950s. Already in this time period there is quite an evolution of printing style, from the soft-focus, warm-toned, painterly “Parmelian prints” of the 1920s; through the f/64 school of sharp-focused photography that he co-founded with Edward Weston and Imogen Cunningham in the 1930s; and, after the War, towards a cooler, higher-contrast printmaking approach. Several singular examples are included in this exhibition. The extraordinarily rare print of Moonrise, Hernandez is one of the earliest extant – with its light gray (rather than deep black) sky with wispy clouds, it is literally “day and night” when compared to his much more common, much darker, printings from the 1970s and 1980s. The print of Frozen Lake and Cliffs is considered the finest vintage print extant; it was the announcement for the blockbuster show “Ansel Adams at 100,” curated by the late John Szarkowski. Monolith, the Face of Half Dome is represented by two contrasting examples: the vintage 6x8 inch Parmelian print from 1927, and a rare transitional 16x20 inch matte-surface mounted print from the early 1940s which shows Adams first experimenting with scale but not yet consistently committed to glossy paper stock. 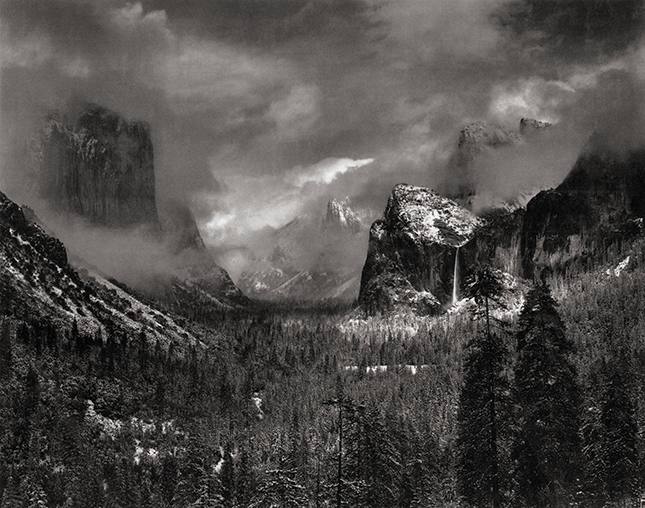 Clearing Winter Storm, taken from Inspiration Point, is Adams' most celebrated Yosemite view. We are pleased to feature the earliest known vintage print of this seminal image (a 1938 date appears on his original typewritten label), which just surfaced in 2005. Hitherto this photograph had generally been dated “circa 1944”; it is noteworthy that such an iconic image can be re-dated in this manner by a full six years.